Exhibiting Show Quality American Broken Guinea Pigs. Welcome to our Caviary . . . . . . .
We are located on the Central Coast of California, in the town of Orcutt. My daughter, Megan, and I raise show quality cavies for 4-H. We raise Americans, in a variety of Brokens and TSW. We belong to La Graciosa 4-H Club in Orcutt, CA. Megan started Market Goats last year. So we have condenced our heard down some. We are no longer raising cavies for 4-H, we have only pet cavies now. Megan is raising market goats for 4H now, but we are leaving up our cavy web site because we will still be attend some shows, and have babies now and then. Your can find us at our 4H web site or our family web site Orcutt Creek Ranch or La Graciosa 4H Club .Our web-sites have lots of up to date information on shows and breeders. We also have a links page to different clubs, games, websites,etc. Here are a few Cavy Clubs you should check out. ACBA, GSCBA, CSRCBA, & CCCBA. You can also find there address on our links page of this site. 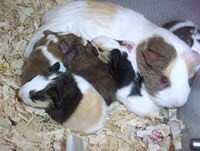 **You can also see some of the babies we have had and litters to look forward to. We have 1 sows ready to litter in September these babies will be ready for sale in November. All images and photos properity of California Cavys. Copyright© 2001 -2009 All rights reserved.